When I got the iPhone 5 I made the decision that the slimness of the phone combined with the wonderful feel of aluminum and glass exterior would make covering up such a thing of beauty a crime. I carried my iPhone 5 around without a case for almost a year and the phone still looked just as good as the day I pulled it out of the box brand new. I really enjoyed carrying around such a slim lightweight phone. Then I read an article about a company called distil union, specifically I read about thier (new and a kickstarter at the time) Wally Case for iPhone. I have always wanted to be able to carry just the bare essentials from my wallet with me without actually having to carry a wallet, but after going caseless with my iPhone I just couldn't bare to put my phone back in a case. 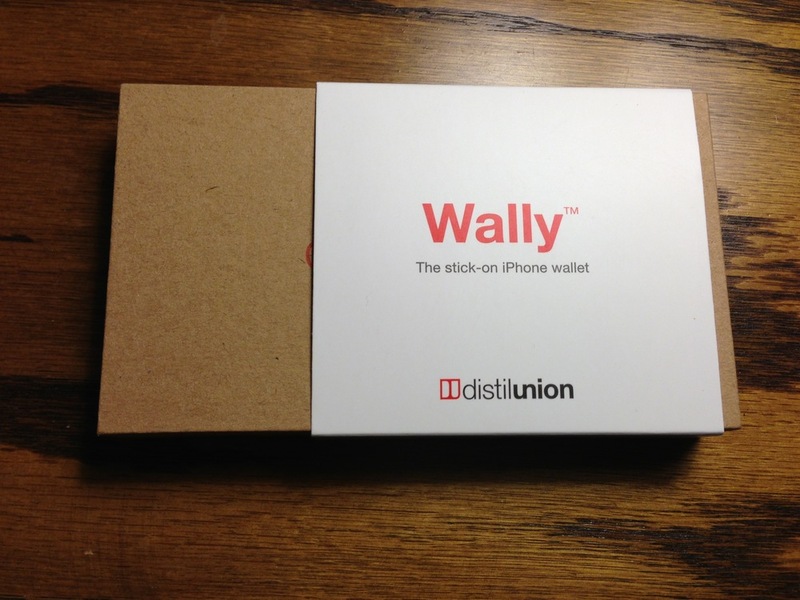 That's when I saw that distil union made a similar product called the Wally stick-on wallet. That, I could consider attaching to my naked iPhone! What is the Wally exactly? It's a high quality leather "pouch" sticker that you put on the back of your phone. The "pouch" has a red pull-tab built into it that pulls the contents of the wallet out so you can access them. The wallet itself can carry up to 3 credit cards (or rewards cards, driver's license, etc...) or two cards and a couple of paper bills. So I pulled the trigger and bought the Wally stick-on wallet. I ordered a few extra "refill" stickers because I knew I was going to be getting the iPhone 5s when it came out and I would need to take the Wally off my iPhone 5 and install it on my iPhone 5s. The installation of the Wally was incredibly easy. You simply pull the backing sticker off of the Wally and apply the Wally to the back of your phone. There is plenty of "sticky" on the Wally so you can apply it and immediately pull it off again until you get it applied in just the perfect orientation. Once you are happy with the fit, press down and rub the Wally to ensure it gets a proper stick to the back of your phone and the installation is complete. I love this wallet! It is so nice knowing that I have a wallet with me everywhere I go now. The Wally does add some extra weight and thickness to my iPhone and I thought I would NOT like that, but I really don't mind. In fact, the extra weight and the little bit of extra grip I get from the leather make the iPhone much more comfortable to hold. I'm not sure what it is, but having the Wally makes me much less concerned about dropping my iPhone. It adds very little extra protection (other covering up the back of the phone so it doesn't get scratched), but I think its the extra grip that makes it feel so much more stable in my hand. I wear dress pants to work and I refuse to carry a wallet in my back pocket, so both my iPhone and any wallet I carry must go in my front pants pocket. I really liked how thin the iPhone 5 and 5s were in that they didn't result in making it look like I had a large brick in my dress pant's pocket. The Wally didn't add any perceivable thickness to the iPhone while it is my pocket, in fact it had a very unexpected benifit. With the Wally on the back of my iPhone I no longer have a pronounced rectuagular shape visible in my dress pants pocket. The Wally rounds out the back of my iPhone just a little bit so it makes the shape of the iPhone while in my pocket less pronounced. The quality of the leather is superb! It feels great. It has a soft but not buttery soft feel and because its not too soft it holds up extreemly well. I've had the Wally for about 6-months now and there is no visible wear to the leather other than it feels broken in like a high quality leather wallet should. There is really no down-side to the Wally. It feels great, is extremely functional and adds very little weight or thickness to the phone. The only thing I have noticed with the Wally is that you have to be careful to not put too much into it. If it gets overfilled and the phone warms up (like when using it heavily when in a poor cellular coverage area), the heat from the phone and the stress on the Wally from being so full causes the Wally to start detatching from the back of the phone. No worries though, just press the wally back down against the iPhone and after the phone cools back down the Wally is once again firmly attached. Again, this only happens when you put too much into the Wally. If you have ever considered getting some kind of iPhone Wallet case and don't want the heft of having a case on your phone I highly recommend the Wally stick-on wallet. If you really need the protection of having a case on your phone then the Wally Case for iPhone is probably a better choice for you. The Wally runs $39.99 and the Wally case is $49.99. Another bonus, if you bought a Coin or are thinking about getting a Coin, the Coin makes a wallet like the Wally even more practical. Never heard of Coin? See my blog post about it here (see item 9 in the list).